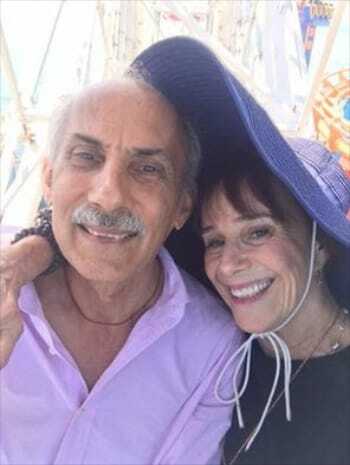 Ram Dass marries Trudy Goodman and Jack Kornfield. Photo by Richard Marks, via Spirit Rock Meditation Center on Facebook. 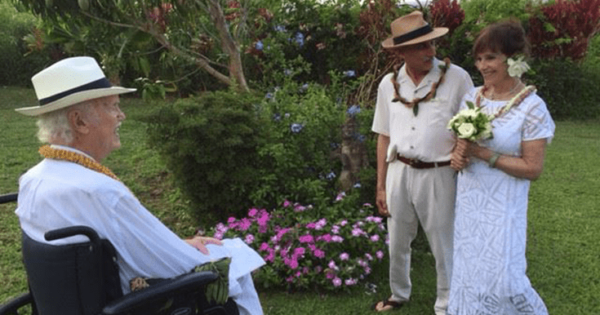 Dharma teachers Trudy Goodman and Jack Kornfield were married in Maui, Hawaii this past weekend. According to a post on Spirit Rock Meditation Center’s Facebook page, the two were married by spiritual teacher and Be Here Now author, Ram Dass, in his Haiku Garden. We are delighted to share the happiness of our Hawaiian wedding day. We have known each other for 43 years and come to love each other deeply. The special day began with Ram Dass’s weekly community beach swim. 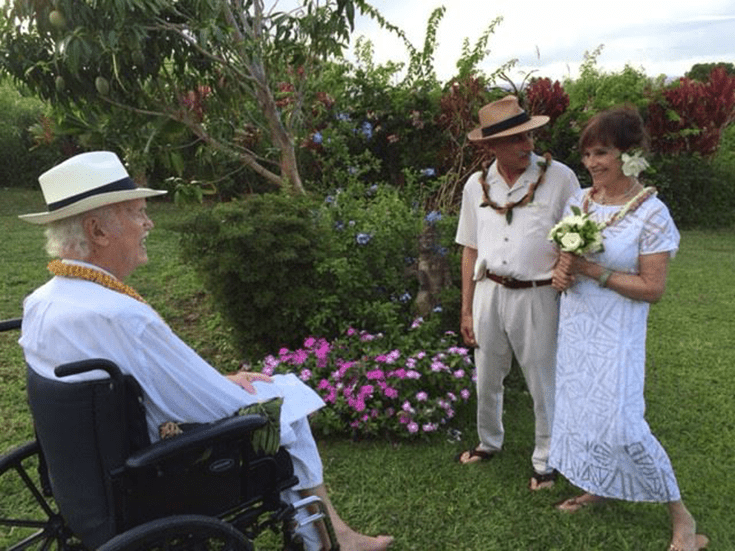 Later, before sunset, as soft Maui breezes blew and the clouds turned rosy colors, we had a private ceremony in Ram Dass’s Haiku garden, exchanging vows, leis, and rings. In poetic language, Ram Dass married us to each other and to the Dharma, and offered his blessings to us, our families, friends, and communities. 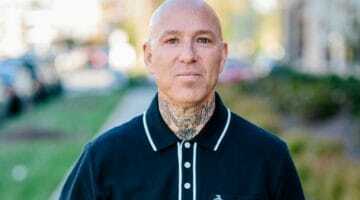 He asked each of us, “Do you take Jack/Trudy as part of your sangha?” We both wholeheartedly answered “Yes!” We are all sangha together, and now you are happily included. In the past weeks we have received waves of good wishes from friends all over the globe—hearing our nuptial plans has made them smile. And here we are, newly wed, blessed and grateful. “Engaged Buddhists”: Jack Kornfield and Trudy Goodman, via InsightLA. Yesterday, Jack really wanted to go on the Ferris Wheel. It stopped in my favorite spot, where you hang out in space over the ocean (you can’t see the cabin below for a few seconds), but we did stop there for a while. Turns out, Jack had asked them to stop the Ferris Wheel there so he could propose. Which he did. You may not be surprised to hear that I happily said, YES! 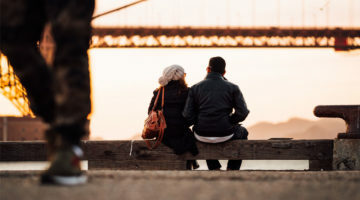 Jack Kornfield: After my marriage ended—and I had expected I would be married for the rest of my life, so it was not particularly easy—I thought, “Well, who would I like to be with? Who do I feel a connection and love with and who brings to me a kind of a joy?” Well, of course, Trudy. Trudy Goodman: We were teaching together and working together. It was such a pleasure to discover we were on the same page. It happened very organically. Our congrats to Trudy and Jack. Here’s to a life of being on the same page together!